Amazon has quietly expanded its Amazon Logistics Photo On Delivery program. The service involves sending a picture of a package on a customer’s porch or doorstep, letting them know when and where it was delivered. The e-commerce giant has been testing the program for at least six months, according to USA Today, but it’s expanding as the Amazon Logistics delivery service grows. Amazon is getting more acquainted with your front porch. Business Insider/Hayley Peterson HerrinWhat a typical photo confirmation looks like. According to USA Today, the online retailer has recently expanded a program called Amazon Logistics Photo On Delivery that involves a carrier taking a photo of a package after delivering it. Amazon forwards that photo to the customer, who can view it in the Your Orders section on the website or in a delivery notification on the app. The photo, included in the delivery confirmation, is meant to help the customer identify where and when the packages were left. But Amazon also does this for internal insurance – it gets a record of whether the package was left at the customer’s specified delivery location, should the customer say they never received it. “Amazon is constantly investing and innovating on behalf of our customers. 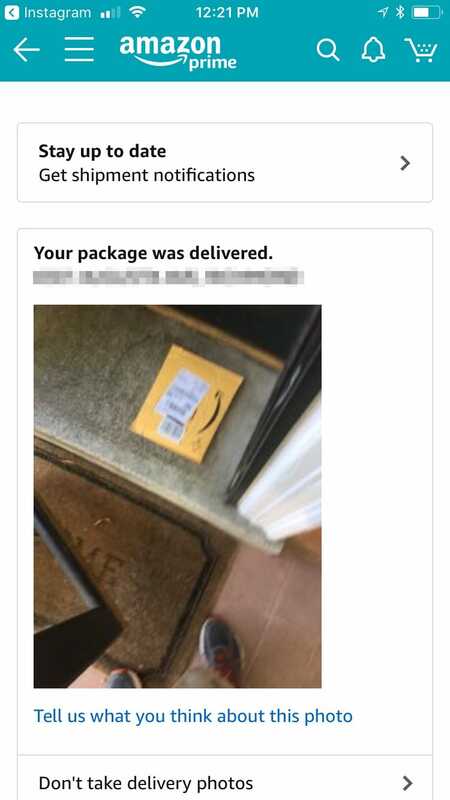 Amazon Logistics Photo On Delivery provides visual delivery confirmation – it shows customers that their package was safely delivered and where, and it’s one of many delivery innovations we’re working on to improve convenience for customers,” Kristen Kish, an Amazon spokeswoman, told Business Insider. The program is tied to Amazon’s Logistics delivery service, which still accounts for a relatively small portion of its deliveries. According to The Verge, the photo program is available in markets in Oregon, Las Vegas, Indianapolis, Seattle, San Francisco, and Northern Virginia. Amazon has been testing the program for at least six months but recently updated the app its carriers use to give all of them access, USA Today reported. For those who find the photos intrusive or unnecessary, it’s possible to opt out of the service at any time.